^ Cassius Dio asserts that the Annii were near-kin of Hadrian, and that it was to these familial ties that they owed their rise to power. The precise nature of these kinship ties is nowhere stated. One conjectural bond runs through Annius Verus (II). Verus' wife Rupilia Faustina was the daughter of the consular senator Libo Rupilius Frugi and an unnamed mother. It has been hypothesized Rupilia Faustina's mother was Matidia, who was also the mother (presumably through another marriage) of Vibia Sabina, Hadrian's wife. ^ Birley amends the text of the HA Marcus from "Eutychius" to "Tuticius". ^ Others put a harsher light on Hadrian's nickname. McLynn calls it an example of Hadrian's waspish (McLynn says "vespine") wit and adduces it in support of his contention that Marcus was a "prig". ^ Birley, following the textual and epigraphic citations, concludes that he might only have seen Rome in 127, briefly in 128, and in 131. ^ Commodus was a known consumptive at the time of his adoption, so Hadrian may have intended Marcus' eventual succession anyways. ^ Moderns have not offered as positive an assessment. His second modern editor, Niebhur, thought him stupid and frivolous; his third editor, Naber, found him contemptible. Historians have seen him as a "pedant and a bore", his letters offering neither the running political analysis of a Cicero or the conscientious reportage of a Pliny. Recent prosopographic research has rehabilitated his reputation, though not by much. ^ Champlin notes that Marcus' praise of him in the Meditations is out of order (he is praised immediately after Diognetus, who had introduced Marcus to philosophy), giving him special emphasis. ^ Although part of the biographer's account of Lucius is fictionalized (probably to mimic Nero, whose birthday Lucius shared), and another part poorly compiled from a better biographical source,。scholars have accepted these biographical details as accurate. ^ These name-swaps have proven so confusing that even the Historia Augusta, our main source for the period, cannot keep them straight. The fourth-century ecclesiastical historian Eusebius of Caesarea shows even more confusion. The mistaken belief that Lucius had the name "Verus" before becoming emperor has proven especially popular. ^ There was, however, much precedent. The consulate was a twin magistracy, and earlier emperors had often had a subordinate lieutenant with many imperial offices (under Pius, the lieutenant had been Marcus). Many emperors had planned a joint succession in the past?Augustus planned to leave Gaius Caesar and Lucius Caesar as joint emperors on his death; Tiberius wished to have Gaius Caligula and Tiberius Gemellus do so as well; Claudius left the empire to Nero and Britannicus, imagining that they would accept equal rank?but all of these arrangements had ended in failure, either through premature death (Gaius and Lucius Caesar) or judicial murder (Gemellus by Caligula and Britannicus by Nero). ^ Since 15 CE, the river had been administered by a Tiber Conservancy Board, with a consular senator at its head and a permanent staff. In 161, the curator alevi Tiberis et riparum et cloacarum urbis ("Curator of the Tiber Bed and Banks and the City Sewers") was A. Platorius Nepos, son or grandson of the builder of Hadrian's Wall, whose name he shares. He probably had not been particularly incompetent. A more likely candidate for that incompetence is Nepos' likely predecessor, M. Statius Priscus. A military man and consul for 159, Priscus probably looked on the office as little more than "paid leave". ^ The whole section of the vita dealing with Lucius' debaucheries (HA Verus 4.4?6.6), however, is an insertion into a narrative otherwise entirely cribbed from an earlier source. Most of the details are fabricated by the biographer himself, relying on nothing better than his own imagination. ^ Dio 69.21.1; HA Marcus 1.9; McLynn, 24. ^ Dio 69.21.1; HA Marcus 1.10; McLynn, 24. ^ Western Civilization: Sources, Images and Interpretations, Dennis Sherman, Vol. 1, 5th Ed., p. 104. ^ Birley, Marcus Aurelius, 229 30. The thesis of single authorship was first proposed in H. Dessau's "Uber Zeit und Personlichkeit der Scriptoes Historiae Augustae" (in German), Hermes 24 (1889), 337ff. ^ Birley, Marcus Aurelius, 230. On the HA Verus, see Barnes, 65?74. ^ Birley, Marcus Aurelius, 227. ^ Birley, Marcus Aurelius, 228?29, 253. ^ Birley, Marcus Aurelius, 227?28. ^ Birley, Marcus Aurelius, 228. ^ Birley, Marcus Aurelius, 49. ^ HA Marcus 1.2, 1.4; Birley, Marcus Aurelius, 28; McLynn, 14. ^ Dio 69.21.2, 71.35.2?3; Birley, Marcus Aurelius, 31. ^ Codex Inscriptionum Latinarum 14.3579; Birley, Marcus Aurelius, 29; McLynn, 14, 575 n. 53, citing Ronald Syme, Roman Papers 1.244. ^ Birley, Marcus Aurelius, 29; McLynn, 14. ^ Birley, Marcus Aurelius, 31, 44. ^ Birley, Marcus Aurelius, 29, citing Pliny, Epistulae 8.18. ^ Birley, Marcus Aurelius, 30. ^ a b Birley, Marcus Aurelius, 31. ^ Meditations 1.1, qtd. and tr. Birley, Marcus Aurelius, 31. ^ HA Marcus 2.1 and Meditations 5.4, qtd. in Birley, Marcus Aurelius, 32. ^ Meditations 1.3, qtd. in Birley, Marcus Aurelius, 35. ^ Meditations 1.17.7, qtd. and tr. Birley, Marcus Aurelius, 35. ^ a b Birley, Marcus Aurelius, 33. ^ Ad Marcum Caesarem 2.8.2 (= Haines 1.142), qtd. and tr. Birley, Marcus Aurelius, 31. ^ Birley, Marcus Aurelius, 31?32. ^ Meditations 1.1, qtd. and tr. Birley, Marcus Aurelius, 35. ^ Birley, Marcus Aurelius, 35. ^ Meditations 1.17.2; Farquharson, 1.102; McLynn, 23; cf. Meditations 1.17.11; Farquharson, 1.103. ^ Meditations 1.4; McLynn, 20. ^ HA Marcus 2.2, 4.9; Meditations 1.3; Birley, Marcus Aurelius, 37; McLynn, 21?22. ^ HA Marcus 2.6; Birley, Marcus Aurelius, 38; McLynn, 21. ^ Birley, Later Caesars, 109, 109 n.8; Marcus Aurelius, 40, 270 n.27, citing Bonner Historia-Augusta Colloquia 1966/7, 39ff. ^ HA Marcus 2.3; Birley, Marcus Aurelius, 40, 270 n.27. ^ Birley, Marcus Aurelius, 40, citing Aelius Aristides, Oratio 32 K; McLynn, 21. ^ Meditations 1.10; Birley, Marcus Aurelius, 40; McLynn, 22. ^ Birley, Marcus Aurelius, 40, 270 n.28, citing A.S.L. Farquharson, The Meditations of Marcus Antoninus (Oxford, 1944) 2.453. ^ HA Marcus 4.1, 4.2; Birley, Marcus Aurelius, 36. ^ HA Marcus 1.10, 2.1; Birley, Marcus Aurelius, 38; "Hadrian to the Antonines", 147. The appellation also survives on inscriptions: Birley cites (at Marcus Aurelius, p. 270 n.24) Prosopographia Imperii Romani2 A 697, and L'Annee epigraphique 1940.62. On the Salii, see: Birley, Marcus Aurelius, 36?37; McLynn, 18?19. ^ McLynn, 18, citing Michael Grant, The Antonines (1994), 26 for the characterization of verissimus as an example of Hadrian's waspish wit. ^ HA Marcus 4.4; Birley, Marcus Aurelius, 37; McLynn, 19. ^ Birley, Marcus Aurelius, 38, 270 n.24. ^ HA Marcus 4.5; Birley, Marcus Aurelius, 39?40; McLynn, 24?25; R. Syme, "The Ummidii", Historia 17:1 (1968): 93?94. ^ HA Marcus 4.6; Birley, Marcus Aurelius, 41. ^ Birley, Marcus Aurelius, 41. ^ HA Marcus 4.7; Birley, Marcus Aurelius, 41. ^ Birley, Marcus Aurelius, 41?42. ^ HA Hadrian 23.15?16; Birley, Marcus Aurelius, 45; "Hadrian to the Antonines", 148. ^ Dio 69.17.1; HA Aelius 3.7, 4.6, 6.1?7; Birley, "Hadrian to the Antonines", 147. ^ Birley, Marcus Aurelius, 46. Date: Birley, "Hadrian to the Antonines", 148. ^ Dio 69.21.1; HA Hadrian 24.1; HA Aelius 6.9; HA Pius 4.6?7; Birley, Marcus Aurelius, 48?49. ^ HA Marcus 5.3; Birley, Marcus Aurelius, 49. ^ Birley, Marcus Aurelius, 49?50. ^ HA Marcus 5.6?8, qtd. and tr. Birley, Marcus Aurelius, 50. ^ Dio 69.22.4; HA Hadrian 25.5?6; Birley, Marcus Aurelius, 50?51. 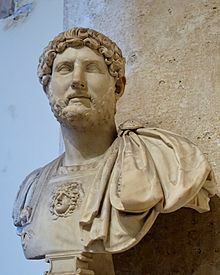 Hadrian's suicide attempts: Dio 69.22.1?4; HA Hadrian 24.8?13. ^ HA Hadrian 25.7; Birley, Marcus Aurelius, 53. ^ HA Pius 5.3, 6.3; Birley, Marcus Aurelius, 55?56; "Hadrian to the Antonines", 151. ^ Birley, Marcus Aurelius, 55; "Hadrian to the Antonines", 151. ^ HA Marcus 6.2; Verus 2.3?4; Birley, Marcus Aurelius, 53?54. ^ Dio 71.35.5; HA Marcus 6.3; Birley, Marcus Aurelius, 56. ^ Meditations 6.30, qtd. and tr. Birley, Marcus Aurelius, 57; cf. Marcus Aurelius, 270 n.9, with notes on the translation. ^ a b HA Marcus 6.3; Birley, Marcus Aurelius, 57. ^ Birley, Marcus Aurelius, 57, 272 n.10, citing Codex Inscriptionum Latinarum 6.32, 6.379, cf. Inscriptiones Latinae Selectae 360. ^ Meditations 5.16, qtd. and tr. Birley, Marcus Aurelius, 57. ^ Meditations 8.9, qtd. and tr. Birley, Marcus Aurelius, 57. ^ Birley, Marcus Aurelius, 57?58. ^ Ad Marcum Caesarem 4.7, qtd. and tr. Birley, Marcus Aurelius, 90. ^ HA Marcus 6.5; Birley, Marcus Aurelius, 58. ^ a b Birley, Marcus Aurelius, 89. ^ Ad Marcum Caesarem 5.1, qtd. and tr. Birley, Marcus Aurelius, 89. ^ Ad Marcum Caesarem 4.8, qtd. and tr. Birley, Marcus Aurelius, 89. ^ Dio 71.36.3; Birley, Marcus Aurelius, 89. ^ Birley, Marcus Aurelius, 90?91. ^ HA Pius 10.2, qtd. and tr. Birley, Marcus Aurelius, 91. ^ Birley, Marcus Aurelius, 91. ^ Birley, Marcus Aurelius, 61. ^ HA Marcus 2.4; Birley, Marcus Aurelius, 62. ^ Alan Cameron, review of Anthony Birley's Marcus Aurelius, Classical Review 17:3 (1967): 347. ^ Vita Sophistae 2.1.14; Birley, Marcus Aurelius, 63?64. ^ Aulus Gellius, Noctes Atticae 9.2.1?7; Birley, Marcus Aurelius, 64?65. ^ Aulus Gellius, Noctes Atticae 19.12, qtd. and tr. Birley, Marcus Aurelius, 65. ^ Birley, Marcus Aurelius, 65. ^ Birley, Marcus Aurelius, 67?68, citing E. Champlin, Fronto and Antonine Rome (1980), esp. chs. 3 and 4. ^ a b Birley, Marcus Aurelius, 65?67. ^ Ronald Mellor, review of Edward Champlin's Fronto and Antonine Rome, The American Journal of Philology 103:4 (1982): 460. ^ Cf., eg. : Ronald Mellor, review of Edward Champlin's Fronto and Antonine Rome, The American Journal of Philology 103:4 (1982): 461 and passim. ^ a b Birley, Marcus Aurelius, 69. ^ Ad Marcum Caesarem 4.6 (= Haines 1.80ff), qtd. and tr. Birley, Marcus Aurelius, 76. ^ Ad Marcum Caesarem 4.6 (= Haines 1.80ff); Birley, Marcus Aurelius, 76?77. ^ Ad Marcum Caesarem 3.10?11 (= Haines 1.50ff), qtd. and tr. Birley, Marcus Aurelius, 73. ^ Birley, Marcus Aurelius, 73. ^ Champlin, "Chronology of Fronto", 138. ^ Ad Marcum Caesarem 5.74 ( =Haines 2.52ff), qtd. and tr. Birley, Marcus Aurelius, 73. ^ Birley, Marcus Aurelius, 77. On the date, see Champlin, "Chronology of Fronto", 142, who (with Bowersock, Greek Sophists in the Roman Empire (1964), 93ff) argues for a date in the 150s; Birley, Marcus Aurelius, 78?79, 273 n.17 (with Ameling, Herodes Atticus (1983), 1.61ff, 2.30ff) argues for 140. ^ Ad Marcum Caesarem 3.2 (= Haines 1.58ff), qtd. and tr. Birley, Marcus Aurelius, 77?78. ^ Ad Marcum Caesarem 3.3 (= Haines 1.62ff); Birley, Marcus Aurelius, 78. ^ Ad Marcum Caesarem 3.3 (= Haines 1.62ff), qtd. and tr. Birley, Marcus Aurelius, 79. ^ Birley, Marcus Aurelius, 80. ^ Ad Marcum Caesarem 4.13 (= Haines 1.214ff), qtd. and tr. Birley, Marcus Aurelius, 93. ^ Ad Marcum Caesarem 4.3.1 (= Haines 1.2ff); Birley, Marcus Aurelius, 94. ^ Ad Marcum Caesarem 4.3, qtd. and tr. Birley, Marcus Aurelius, 69. ^ De Eloquentia 4.5 (= Haines 2.74), qtd. and tr. Birley, Marcus Aurelius, 95. Alan Cameron, in his review of Birley's biography (The Classical Review 17:3 (1967): 347), suggests a reference to chapter 11 of Arthur Darby Nock's Conversion (Oxford: Oxford University Press, 1933, rept. 1961): "Conversion to Philosophy". ^ Birley, Marcus Aurelius, 94, 105. ^ HA Marcus 3.5?8, qtd. and tr. Birley, Marcus Aurelius, 94. ^ Birley, Marcus Aurelius, 95; Champlin, Fronto, 120. ^ Champlin, Fronto, 174 n. 12. ^ Birley, Marcus Aurelius, 94?95, 101. ^ Meditations 1.7, qtd. and tr. Birley, Marcus Aurelius, 94?95. ^ Birley, Marcus Aurelius, 103. ^ Birley, Marcus Aurelius, 206?7. ^ Meditations 9.40, qtd. and tr. Birley, Marcus Aurelius, 207. ^ Meditations 10.34, tr. Farquharson, 78, 224. ^ HA Verus 2.9?11; 3.4?7; Birley, Marcus Aurelius, 108. ^ Suetonius, Nero 6.1; HA Verus 1.8; Barnes, 67; Birley, Marcus Aurelius, 158. See also: Barnes, 69?70; Pierre Lambrechts, "L'empereur Lucius Verus. Essai de rehabilitation" (in French), Antiquite Classique 3 (1934), 173ff. ^ Barnes, 66. Poorly compiled: eg. Barnes, 68. ^ HA Verus 2.9?11; 3.4?7; Barnes, 68; Birley, Marcus Aurelius, 108. ^ Barnes, 68, citing J. Vogt, Die Alexandrinischen Miinzen (1924), I, III; 2, 62ff. ^ Birley, Marcus Aurelius, 112. ^ Birley, Marcus Aurelius, 114. ^ HA Pius 12.4?8; Birley, Marcus Aurelius, 114. ^ Dio 71.33.4?5; Birley, Marcus Aurelius, 114. ^ HA Marcus 7.5, qtd. and tr. Birley, Marcus Aurelius, 116. ^ Birley, Marcus Aurelius, 116. Birley takes the phrase horror imperii from HA Pert. 13.1 and 15.8. ^ Birley, Marcus Aurelius, 116?17. ^ a b c d Birley, Marcus Aurelius, 117. ^ HA Marcus 7.9; Verus 4.3; Birley, Marcus Aurelius, 117?18. ^ HA Marcus 7.9; Verus 4.3; Birley, Marcus Aurelius, 117?18. "twice the size": Richard Duncan-Jones, Structure and Scale in the Roman Economy (Cambridge: Cambridge University Press, 1990), 109. ^ a b Birley, Marcus Aurelius, 118. ^ HA Marcus 7.10, tr. David Magie, cited in Birley, Marcus Aurelius, 118, 278 n.6. ^ HA Marcus 7.10?11; Birley, Marcus Aurelius, 118. ^ HA Pius 12.8; Birley, Marcus Aurelius, 118?19. ^ HA Marcus 7.4; Birley, Marcus Aurelius, 119. ^ HA Comm. 1.3; Birley, Marcus Aurelius, 119. ^ HA Comm. 1.2; Birley, Marcus Aurelius, 119. ^ HA Marcus 19.1?2; Birley, Marcus Aurelius, 278 n.9. ^ HA Comm. 1.4, 10.2; Birley, Marcus Aurelius, 119. ^ Birley, Marcus Aurelius, 119, citing H. Mattingly, Coins of the Roman Empire in the British Museum IV: Antoninus Pius to Commodus (London, 1940), Marcus Aurelius and Lucius Verus, nos. 155ff. ; 949ff. ^ HA Marcus 7.7; Birley, Marcus Aurelius, 118. ^ Birley, Marcus Aurelius, 118, citing Werner Eck, Die Organisation Italiens (1979), 146ff. ^ HA Marcus 8.1, qtd. and tr. Birley, Marcus Aurelius, 119; "Hadrian to the Antonines", 157. ^ Birley, Marcus Aurelius, 122?23, citing H.G. Pfalum, Les carrieres procuratoriennes equestres sous le Haut-Empire romain I?III (Paris, 1960?61); Supplement (Paris, 1982), nos. 142; 156; Eric Birley, Roman Britain and the Roman Army (1953), 142ff., 151ff. ^ Birley, Marcus Aurelius, 123, citing H.G. Pfalum, Les carrieres procuratoriennes equestres sous le Haut-Empire romain I?III (Paris, 1960?61); Supplement (Paris, 1982), no. 141. ^ HA Marcus 8.8; Birley, Marcus Aurelius, 123, citing W. Eck, Die Satthalter der germ. Provinzen (1985), 65ff. ^ Birley, Marcus Aurelius, 120, citing Ad Verum Imperator 1.3.2 (= Haines 1.298ff). ^ Ad Antoninum Imperator 4.2.3 (= Haines 1.302ff), qtd. and tr. Birley, Marcus Aurelius, 119. ^ a b Birley, Marcus Aurelius, 120. ^ Birley, Marcus Aurelius, 120, citing Ad Verum Imperator 1.1 (= Haines 1.305). ^ Ad Antoninum Imperator 4.1 (= Haines 1.300ff), qtd. and tr. Birley, Marcus Aurelius, 120. ^ HA Marcus 8.3?4; Birley, Marcus Aurelius, 120. ^ Birley, Marcus Aurelius, 120, citing H. Mattingly, Coins of the Roman Empire in the British Museum IV: Antoninus Pius to Commodus (London, 1940), Marcus Aurelius and Lucius Verus, nos. 841; 845. ^ Gregory S. Aldrete, Floods of the Tiber in ancient Rome (Baltimore: Johns Hopkins University Press, 2007), 30?31. ^ HA Marcus 8.4?5; Birley, Marcus Aurelius, 120. ^ Inscriptiones Latinae Selectae 5932[リンク切れ] (Nepos), 1092[リンク切れ] (Priscus); Birley, Marcus Aurelius, 121. ^ Fergus Millar, The Emperor in the Roman World, 31 BC ? AD 337 (London: Duckworth, 1977), 6 and passim. See also: idem. "Emperors at Work", Journal of Roman Studies 57:1/2 (1967): 9?19. ^ Digest 31.67.10, qtd. and tr. Birley, Marcus Aurelius, 133. ^ Birley, Marcus Aurelius, 133. ^ HA Pius 12.7; Birley, Marcus Aurelius, 114, 121. ^ Event: HA Marcus 8.6; Birley, Marcus Aurelius, 121. Date: Jaap-Jan Flinterman, "The Date of Lucian's Visit to Abonuteichos," Zeitschrift fur Papyrologie und Epigraphik 119 (1997): 281. ^ HA Marcus 8.6; Birley, Marcus Aurelius, 121. ^ Lucian, Alexander 27; Birley, Marcus Aurelius, 121. ^ Lucian, Alexander 27; Birley, Marcus Aurelius, 121?22. On Alexander, see: Robin Lane Fox, Pagans and Christians (Harmondsworth: Penguin, 1986), 241?50. ^ Birley, Marcus Aurelius, 278 n.19. ^ Dio 71.2.1; Lucian, Historia Quomodo Conscribenda 21, 24, 25; Birley, Marcus Aurelius, 121?22. ^ HA Marcus 8.7; Birley, Marcus Aurelius, 122. ^ HA Pius 7.11; Marcus 7.2; Birley, Marcus Aurelius, 103?4, 122. ^ Pan. Ath. 203?4, qtd. and tr. Alan Cameron, review of Anthony Birley's Marcus Aurelius, The Classical Review 17:3 (1967): 349. ^ HA Marcus 8.6; Birley, Marcus Aurelius, 123. ^ Corpus Inscriptionum Latinarum 8.7050?51; Birley, Marcus Aurelius, 123. ^ Incriptiones Latinae Selectae 1097[リンク切れ]?98[リンク切れ]; Birley, Marcus Aurelius, 123. ^ Incriptiones Latinae Selectae 1091[リンク切れ]; Birley, Marcus Aurelius, 123. ^ Incriptiones Latinae Selectae 2311[リンク切れ]; Birley, Marcus Aurelius, 123. ^ HA Marcus 12.13; Birley, Marcus Aurelius, 123. ^ L'Annee Epigraphique 1972.657; Birley, Marcus Aurelius, 125. ^ HA Verus 9.2; Birley, Marcus Aurelius, 125. ^ De Feriis Alsiensibus 1 (= Haines 2.3); Birley, Marcus Aurelius, 126. ^ De Feriis Alsiensibus 3.1 (= Haines 2.5), qtd. and tr. Birley, Marcus Aurelius, 126. ^ De Feriis Alsiensibus 3.4 (= Haines 2.9); Birley, Marcus Aurelius, 126?27. ^ De Feriis Alsiensibus 3.6?12 (= Haines 2.11?19); Birley, Marcus Aurelius, 126?27. ^ De Feriis Alsiensibus 4, tr. Haines 2.19; Birley, Marcus Aurelius, 127. ^ De Feriis Alsiensibus 4 (= Haines 2.19), qtd. and tr. Birley, Marcus Aurelius, 127. ^ De bello Parthico 10 (= Haines 2.31), qtd. and tr. Birley, Marcus Aurelius, 127. ^ De bello Parthico 1?2 (= Haines 2.21?23). ^ De bello Parthico 1 (= Haines 2.21), qtd. and tr. Birley, Marcus Aurelius, 127. ^ Ad Verum Imperator 2.1.19 (= Haines 2.149); Birley, Marcus Aurelius, 129. ^ Dio 71.1.3; Birley, Marcus Aurelius, 123. ^ HA Verus 5.8; Birley, Marcus Aurelius, 123, 125. ^ Birley, Marcus Aurelius, 125. ^ HA Marcus 8.9, tr. Magie; Birley, Marcus Aurelius, 123?26. On Lucius' voyage, see: HA Verus 6.7?9; HA Marcus 8.10?11; Birley, Marcus Aurelius, 125?26. ^ Birley, Marcus Aurelius, 129. ^ HA Verus 4.4; Birley, Marcus Aurelius, 129. ^ HA Verus 4.6, tr. Magie; cf. 5.7; Birley, Marcus Aurelius, 129. ^ HA Verus 8.7, 8.10?11; Fronto, Principae Historia 17 (= Haines 2.217); Birley, Marcus Aurelius, 129. ^ HA Verus 9.2; Corpus Inscriptionum Latinarum 3.199; Birley, Marcus Aurelius, 130?31. ^ HA Verus 7.7; Marcus 9.4; Barnes, 72; Birley, "Hadrian to the Antonines", 163; cf. also Barnes, "Legislation Against the Christians", Journal of Roman Studies 58:1?2 (1968), 39; "Some Persons in the Historia Augusta", Phoenix 26:2 (1972), 142, citing the Vita Abercii 44ff. ^ HA Verus 7.10; Lucian, Imagines 3; Birley, Marcus Aurelius, 131. Cf. Lucian, Imagines, Pro Imaginibus, passim. ^ Birley, Marcus Aurelius, 131; "Hadrian to the Antonines", 163. ^ HA Verus 7.7; Marcus 9.4; Birley, Marcus Aurelius, 131. ^ Birley, Marcus Aurelius, 131, citing Anne Epigraphique 1958.15. ^ HA Verus 7.7; Birley, Marcus Aurelius, 131. ^ HA Marcus 9.4; Birley, Marcus Aurelius, 131. ^ HA Marcus 9.5?6; Birley, Marcus Aurelius, 131. ^ HA Marcus 9.1; Birley, "Hadrian to the Antonines", 162. ^ HA Marcus 9.1; HA Verus 7.1?2; Ad Verrum Imperator 2.3 (= Haines 2.133); Birley, Marcus Aurelius, 129; "Hadrian to the Antonines", 162. ^ Birley, Marcus Aurelius, 129; "Hadrian to the Antonines", 162, citing H. Mattingly, Coins of the Roman Empire in the British Museum IV: Antoninus Pius to Commodus (London, 1940), Marcus Aurelius and Lucius Verus, nos. 233ff. ^ Dio 71.3.1; Birley, Marcus Aurelius, 131; "Hadrian to the Antonines", 162; Millar, Near East, 113. ^ Birley, Marcus Aurelius, 280 n. 42; "Hadrian to the Antonines", 162. ^ Birley, Marcus Aurelius, 131; "Hadrian to the Antonines", 162, citing H. Mattingly, Coins of the Roman Empire in the British Museum IV: Antoninus Pius to Commodus (London, 1940), Marcus Aurelius and Lucius Verus, nos. 261ff. ; 300 ff. ^ Birley, Marcus Aurelius, 130, 279 n. 38; "Hadrian to the Antonines", 163, citing Prosopographia Imperii Romani2 M 169; Millar, Near East, 112. ^ Birley, Marcus Aurelius, 130; "Hadrian to the Antonines", 162. ^ Fronto, Ad Verum Imperator 2.1.3 (= Haines 2.133); Astarita, 41; Birley, Marcus Aurelius, 130; "Hadrian to the Antonines", 162. ^ Inscriptiones Latinae Selectae 1098[リンク切れ]; Birley, Marcus Aurelius, 130. ^ Birley, "Hadrian to the Antonines", 163, citing Prosopographia Imperii Romani2 M 169. ^ Lucian, Historia Quomodo Conscribenda 15, 19; Birley, "Hadrian to the Antonines", 163. ^ Lucian, Historia Quomodo Conscribenda 20, 28; Birley, "Hadrian to the Antonines", 163, citing Syme, Roman Papers, 5.689ff. ^ HA Verus 8.3?4; Birley, "Hadrian to the Antonines", 163. Birley cites R.H. McDowell, Coins from Seleucia on the Tigris (Ann Arbor: University of Michigan Press, 1935), 124ff., on the date. ^ Birley, "Hadrian to the Antonines", 164. ^ Birley, "Hadrian to the Antonines", 164, citing H. Mattingly, Coins of the Roman Empire in the British Museum IV: Antoninus Pius to Commodus (London, 1940), Marcus Aurelius and Lucius Verus, nos. 384 ff., 1248 ff., 1271 ff. ^ Birley, "Hadrian to the Antonines", 164, citing P. Kneissl, Die Siegestitulatur der romischen Kaiser. Untersuchungen zu den Siegerbeinamen des 1. und 2. Jahrhunderts (Gottingen, 1969), 99 ff. ^ Birley, "Hadrian to the Antonines", 164, citing H. Mattingly, Coins of the Roman Empire in the British Museum IV: Antoninus Pius to Commodus (London, 1940), Marcus Aurelius and Lucius Verus, nos. 401ff. ^ 2 A 1402f. ; 1405; Astarita, passim; Syme, Bonner Historia-Augustia Colloquia 1984 (= Roman Papers IV (Oxford: Clarendon Press, 1988), ?). ^ Birley, "Hadrian to the Antonines", 164, citing Alfoldy, Konsulat, 24, 221. ^ Pulleyblank, Edwin G.; Leslie, D. D.; Gardiner, K. H. J. (1999). “The Roman Empire as Known to Han China”. Journal of the American Oriental Society 119 (1): 71?79. doi:10.2307/605541. http://jstor.org/stable/605541. ^ Dio 72.11.3?4; Ad amicos 1.12 (= Haines 2.173); Birley, Marcus Aurelius, 132. ^ Dio 72.11.3?4; Birley, Marcus Aurelius, 132, citing De nepote amisso 2 (= Haines 2.222); Ad Verum Imperator 2.9?10 (= Haines 2.232ff.). ^ Birley, Marcus Aurelius, 133, citing Geza Alfoldy, Konsulat und Senatorenstand (1977), Moesia Inferior: 232 f.; Moesia Superior: 234f. ; Pannonia Superior: 236f. ; Dacia: 245f. ; Pannonia Inferior: 251. ^ Stertz, 434, citing Themistius, Oratio 6.81; HA Cassius 3.5; Aurelius Victor, De Caesaribus 16.9. ^ Gregory Hays. Introduction to Marcus Aurelius Meditations Weidenfeld and Nicholson London 2003 pp xlviii?xlix. Scott, Samuel P., trans. The Code of Justinian, in The Civil Law. 17 vols. 1932. Online at the Constitution Society. Accessed 31 August 2009. Scott, S.P., trans. The Digest or Pandects in The Civil Law. 17 vols. Cincinnati: Central Trust Company, 1932. Online at the Constitution Society. Accessed 31 August 2009. Cary, Earnest, trans. Roman History. 9 vols. Loeb ed. London: Heinemann, 1914?27. Online at LacusCurtius. Accessed 26 August 2009. Banchich, Thomas M., trans. A Booklet About the Style of Life and the Manners of the Imperatores. Canisius College Translated Texts 1. Buffalo, NY: Canisius College, 2009. Online at De Imperatoribus Romanis. Accessed 31 August 2009. Haines, Charles Reginald, trans. The Correspondence of Marcus Cornelius Fronto. 2 vols. Loeb ed. London: Heinemann, 1920. Online at the Internet Archive: Vol. 1, 2. Accessed 26 August 2009. Rolfe, J.C., trans. The Attic Nights of Aulus Gellius. 3 vols. Loeb ed. London: Heinemann, 1927?28. Vols. 1 and 2 online at LacusCurtius. Accessed 26 August 2009. Echols, Edward C., trans. Herodian of Antioch's History of the Roman Empire. Berkeley and Los Angeles: University of California Press, 1961. Online at Tertullian and Livius. Accessed 14 September 2009. Scott, S.P., trans. Institutes of Gaius in The Civil Law. 17 vols. Cincinnati: Central Trust Company, 1932. Online at the Constitution Society. Accessed 31 August 2009. Harmon, A.M., trans. The Works of Lucian of Samosata. 9 vols. Loeb ed. London: Heinemann, 1936. Alexander online at Tertullian. Accessed 26 August 2009. Historia Quomodo Conscribenda (The Way to Write History). Fowler, H.W., and H.G., trans. The Works of Lucian of Samosata. 4 vols. Oxford: Clarendon Press, 1905. The Way to Write History, in volume 2, online at Sacred Texts, based on the Gutenberg e-text. Accessed 26 August 2009. Imagines (Essays in Portraiture [Images]). Fowler, H.W., and H.G., trans. The Works of Lucian of Samosata. 4 vols. Oxford: Clarendon Press, 1905. A Portrait Study, in volume 3, online at Sacred Texts, based on the Gutenberg e-text. Accessed 26 August 2009. Pro Imaginibus (Essays in Portraiture Defended). Fowler, H.W., and H.G., trans. The Works of Lucian of Samosata. 4 vols. Oxford: Clarendon Press, 1905. Defence of the 'Portrait-Study', in volume 3, online at Sacred Texts, based on the Gutenberg e-text. Accessed 26 August 2009. Farquharson, A.S.L., trans. Meditations. New York: Knopf, 1946, rept. 1992. Jones, W.H.S., and H.A. Omerod, trans. Pausanias' Description of Greece. 4 vols. Loeb ed. London: Heinemann, 1918. Online at Theoi and Perseus at Tufts. Accessed 27 August 2009. Aiken, Ellen Bradshaw, and Jennifer K. Berenson Maclean, trans. On Heroes. Washington, DC: Harvard University Center for Hellenic Studies, 2007. Online at Harvard University Centre for Hellenic Studies[リンク切れ]. Accessed 27 August 2009. Butler, H.E., trans. The Orator's Education. 5 vols. Loeb ed. London: Heinemann, 1920?22. Online at LacusCurtius. Accessed 14 September 2009. Magie, David, trans. Historia Augusta. 3 vols. Loeb ed. London: Heinemann, 1921?32. Online at LacusCurtius. Accessed 26 August 2009. Birley, Anthony R., trans. Lives of the Later Caesars. London: Penguin, 1976. Barnes, Timothy D. "Hadrian and Lucius Verus." Journal of Roman Studies 57:1?2 (1967): 65?79. Champlin, Edward. "The Chronology of Fronto." Journal of Roman Studies 64 (1974): 136?59. Stertz, Stephen A. "Marcus Aurelius as Ideal Emperor in Late-Antique Greek Thought." The Classical World 70:7 (1977): 433?39. Syme, Ronald. "The Ummidii." Historia 17:1 (1968): 72?105.